Every once in a while, generally when I’m running out of ideas or enthusiasm for what to cook, I like to take the kids out to the grocery store and let them pick what we’re going to eat. I do set a few rules, of course, or every time we do this we’d be stuffing our faces with chips or candy — or is Kraft Dinner yet again. Despite my attempts, it rarely ends up being a terribly healthy dinner, but it is always eclectic and different than any time before. 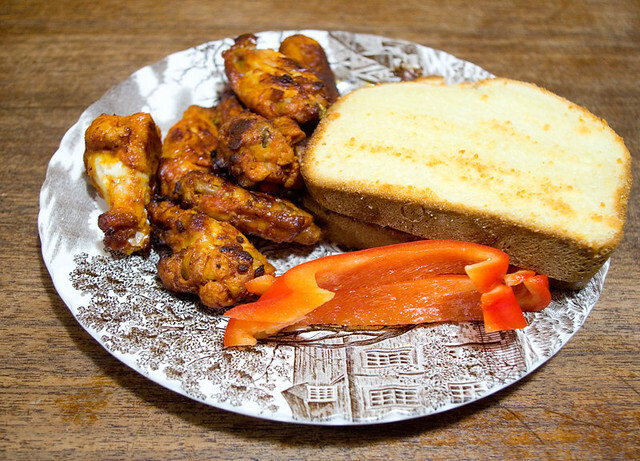 Let’s take this week’s kid-directed meal: mildly spicy grocery store chicken wings (bought frozen and thrown in the oven), garlic bread (made out of homemade bread we already had), and sliced red peppers. It’s honestly not something I would have ever thought to combine as a meal unless I was cleaning out my fridge, but it was actually pretty good!